When Jackson Sky was first approached in the summer of 2014, the initial request was for a site for Public Greens, a new restaurant opening that fall. However, there was also a clear need for all of the Patachou sites to get a major overhaul. The Patachou brand was already a successful one, but their websites lacked cohesion in terms of design, functionality and the platform on which they were built. Last but not least, their existing sites did not feature any of the wide range of photography they had on hand – from mouth-watering entrees to quirky restaurant scenes. 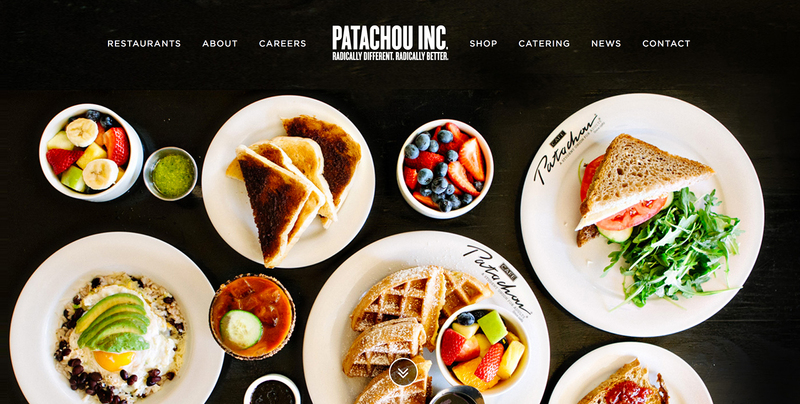 A family of responsive WordPress themes was selected for all the restaurant sites (Cafe Patachou, Public Greens, Petite Chou and Napolese Pizzeria) and the World of Patachou blog. The five sites were customized for each of the brands and launched over the course of the next year and a half. The final site on the list was a new corporate site for Patachou Inc. For this, we designed and developed a custom, responsive, parallax WordPress theme. We also integrated, updated and styled their online store and existing e-commerce plugin. Additionally, we created a custom online form system for each location that the managers can use to place their supply order directly on the site.